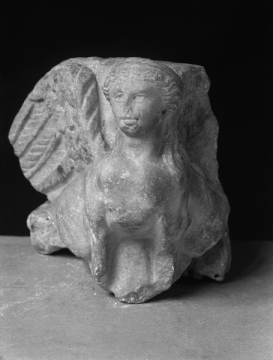 A Grecian Sphinx with long, filleted hair, head turned to the left, pupils expressed; the wings are carved out of either side of the corner and the body divides itself behind the forelegs to follow below the wings in relief, in a similar manner. The object is the right front corner of the base of a funerary altar or cippus of a well known First or earlier Second type (see P. Gusman, L'Art décoratif de Roma de la fin de la république au IV siècle, Paris, 1910, I, pl.57). The sphinx, long a part of Greek funerary monuments, became especially popular in the Augustan and Julio-Claudian decorative arts when Augustus made the sphinx his personal seal, his stamped signature for state documents1. 1 See A. Dessenne, Le sphinx; étude iconographique, Paris, 1957, dealing with the Bronze Age origins of the creature; also Enciclopedia dell'Arte Antica, classica e orientale, Rome, 1966, VII, pp.230-235. Tatham: Etchings, 2; Drawings, 1.